Holden has released design accessory packs for its VF Commodore range, designed to enhance the car’s sports luxury styling and increase personalization, allowing customers to showcase their preferences through their vehicles even more. Customers can choose from subtle sports decorative highlights to the ultimate sports styling package through the new range of Genuine Holden Accessories that are available in modular kits called “Design Packs”, according to a media release from Holden. The Design Packs are classified by numbered “stages” that give the customers the flexibility to build up on the design. Stage One exterior appearance package includes colour-matched upper and lower grille surrounds in red or black, black daylight running lamp surrounds (SS V-Series models) and black fender vents. Stage Two Design Pack includes track stripes, alloy sports pedals, sports carpet floor mats, colour-matched mirror caps, sports engine cover with red accents (V8 models only) and black lip spoiler (sedan only). Finally, Stage three adds four HF-20 20 inch forged alloy wheels in Midnight Dark Grey or a machine faced Gunmetal Gloss and 245/35 ZR20 High Performance tyres. According to information from Car Advice, the three stages will cost $625, $2045 and $5050, respectively. “We’ve always led the market in engineering options for personalisation. The new Design Packs build on this and offer a range of accessories to enhance the striking performance looks of Commodore. 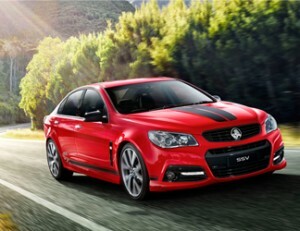 The range allows owners to make a strong statement with their VF,” said Kristian Aquilina, Holden Marketing Manager. “The new Design Packs build on this and offer a range of accessories to enhance the striking performance looks of Commodore. The range allows owners to make a strong statement with their VF,” added Aquilina. The accessories, which have been carefully chosen to complement the exterior design of the VF Commodore sports range, have also been tested by Holden engineers to ensure their durability, quality and appearance. “We understand our customers’ cars are their pride and joy. Protecting the condition of their asset is very important to them, which is why we’ve developed new accessories to help customers maintain the showroom condition of their VF Commodore,” said Holden Engineering Manager for Accessories Keegan Brown. For instance, Holden’s three-piece sports armor is fixed to the front fascia to protect it from everyday wear and tear such as carpark and kerb damage, according to Brown. The track stripes are also designed with UV protection and weather resistance to maintain their look. Aside from the design packs, customers can also look forward to economical improvements such as fuel efficiency, reduced running cost and lower CO2 emissions from the new VF Commodore. With the help of the Australian Government’s $39.8 million Green Car Innovation Fund (GCIF), Holden was able to add a range of advanced fuel economy enablers to their latest offering, including the aluminium componentry, electric power steering and aerodynamic improvements.